This unique camp gives modern-day children the opportunity to explore the life of a colonial child living in Newtown back in 1750 through lots of hands-on activities as well as interactive lectures, discussions and demonstrations. 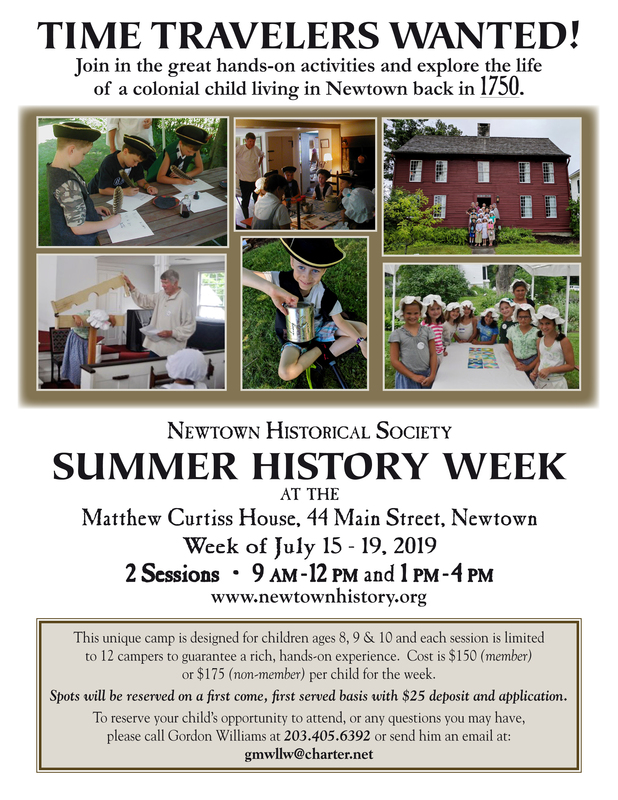 Typically during the third week of July this camp is held at the Matthew Curtiss House on Main street in Newtown. Depending on enrollment, morning and afternoon sessions are offered. Each are limited to 12 campers. Local area children can experience for themselves what it was like to live before technology became a way of life. To get a feeling for what Colonial children wore the campers will discover how a child dressed and will make costumes to wear and keep. They will learn what jobs they might have been expected to do at home, what games they would have played, what lessons were important to learn and what food the family would have eaten. Campers will learn the real meaning of "Sleep tight, don't let the bedbugs bite" and other sayings from the Colonial era. They will make marbles as they were were made centuries ago, and play marble games with their creations. The children will learn other historic skills such as: weaving their own baskets, making their own limn paintings, and practicing the art of tin smithing to create their own candle holders and decorative plates. And nothing seems to be as much fun as learning to create snacks the old-fashioned way by shaking jars of cream to make butter, cranking an old-fashioned ice cream maker and putting together real fruit cobblers and baking them on an open hearth in the Curtiss House kitchen. From an adults perspective, perhaps the best part about attending the camp is that by the end of the session the children have developed a real appreciation for history. Some actually say they love history. Many campers return as junior instructors, leading tours of the Matthew Curtiss House.